Interstate 126 parallels the Saluda River southeast from Interstate 26 near the “Malfunction Junction” interchange with I-20, to a pair of a bridges spanning the Broad River. The freeway concludes at the U.S. 21-176-321 turn from Huger Street to Elmwood Avenue northwest of Downtown. Doubling as U.S. 76 from I-26 east to Elmwood Avenue, Interstate 126 varies between six and eight lanes. There are no exit numbers along the urban freeway. The eastern terminus of Interstate 126 transitions to Business Spur I-126 along Elmwood Avenue. Only signed once in the westbound direction, the 0.50 mile designation overlays U.S. 21, 76, 176 and 321 to South Carolina 277 (Bull Street). The Carolina Crossroads Project will redesign both the full cloverleaf interchange (“Malfunction Junction”) at Interstates 20 and 26 and the adjacent tie in with Interstate 126. An Environmental Impact Statement being prepared by the FHWA and South Carolina Department of Transportation (SDOT) through summer 2017 develops an array of alternatives to address congestion and safety concerns associated with substandard design, weaving traffic patterns and left-hand ramps. Alternatives for the I-20/126 East-West Connector involve extending Interstate 126 west to meet I-20 directly. The Directional Interchange alternative eliminates the current left-hand ramps south of Bush River Road and constructs a new high speed exchange south of the Saluda River. The Bush River alternative retains the left-hand ramps at I-26/126 while extending I-126 to the north of the Saluda River to a full interchange with I-20. The Direct Connector alternative also follows the north side of the Saluda River as it lengths I-126 west to a wye interchange with I-20 west while retaining the left-hand ramps at I-26. Construction on the first phase of road work is expected to commence in 2019. Phases II and III will follow in 2023 and 2027 respectively. Interstate 126 opened in conjunction with I-26 north from U.S. 21-176-321 at Cayce and S.C. 121 outside Newberry in 1960. The freeway was expanded to eight lanes west from Greystone Boulevard in 1988. Sign changes made in 1994 along Interstate 26 east at I-126 replaced tri-color shields with text displaying “Route I-126” for the left-hand exit. The alteration was made to reduce motorist confusion, where drivers merging onto I-26 from adjacent I-20 could not differentiate the two 26’s in time to safely maneuver to their desired ramp.1 Similar issues resulted in the de-signing of Interstate 124 in Chattanooga and displaying I-129 in text on overheads along I-29 at Sioux City, Iowa. A half mile ahead of the freeway end at Huger Street (U.S. 21-176-321), I-126 & U.S. 76 span the confluence of the Broad and Saluda Rivers with eight overall lanes. The two waterways form the Congaree River, which flows 47 miles south to merge with the Wateree River at Lake Marion. Photo taken by Carter Buchanan (04/10/16). Traffic partitions with two lanes joining U.S. 21-176-321 as they follow Huger Street south along the west side of Downtown Columbia toward the University of South Carolina. Photo taken by Carter Buchanan (04/10/16). U.S. 21-176-321 turn east from Huger Street onto Elmwood Avenue at the directional T interchange with Interstate 126. I-126 transitions to unmarked Business Spur I-126 as U.S. 76 combines with Elmwood Avenue to S.C. 277 (Bull Street). Photo taken by Carter Buchanan (04/10/16). Huger Street carries U.S. 21-176-321 north from Blossom Street (U.S. 76 Connector), near the campus of USC, to the east end of Interstate 126 and U.S. 76 at Elmwood Avenue. Photo taken 12/31/12. The six-lane boulevard ends with two lanes turning west from Huger Street to I-126 & U.S. 76 and a single lane ramp for Elmwood Avenue east. U.S. 21-176-321 radiate outward through north Columbia via Main Street, five blocks to the east. Photo taken 12/31/12. U.S. 76 turns west onto Elmwood Avenue from Bull Street (S.C. 277) to combine with U.S. 21-176-321 south at Main Street in three blocks. The ensuing half mile of Elmwood Avenue also represents Business Spur I-126. Pictured here was an older sign referencing the spur. Photo taken by Chris Patriarca (06/08/03). Interstate 126 begins at the Elmwood Avenue viaduct across the Vista Greenway Trail. The freeway commences with two lanes west to Riverbanks Zoo and St. Andrews while U.S. 21-176-321 turn south onto a flyover toward their respective paths to West Columbia. Photo taken by Carter Buchanan (04/10/16). Elmwood Avenue appears along side Interstate 126 & U.S. 76 west as they split with U.S. 21-176-321 south. 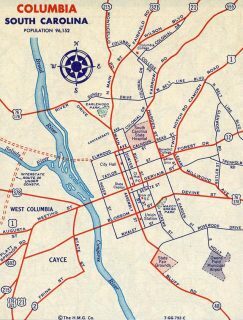 The freeway lines the south side of Elmwood Cemetery to the twin bridges across the Broad River. Photo taken by Carter Buchanan (04/10/16). Interstate 126 & U.S. 76 lead west 1.5 miles from Greystone Boulevard to the flyover connecting with I-26 east through West Columbia and Cayce. Still ahead is the wye interchange for Colonial Life Boulevard north. Photo taken by Carter Buchanan (04/10/16). Colonial Life Boulevard stems north from I-126 to Bush River Road at Dutch Square Mall. Four lanes proceed north to separate with the ramp for I-26 east to Charleston and a bypass ramp for the I-26 cloverleaf interchange with Intestate 20. Photo taken 12/31/12. The mainline of Interstate 126 defaults onto Interstate 26 west to the suburbs of St. Andrews, Irmo and Ballentine. U.S. 76 accompanies I-26 north to U.S. 176 (Broad River Road) in Irmo. Photo taken by Carter Buchanan (04/10/16). A lengthy flyover curves southward to merge with Interstate 26 eastbound after the Saluda River. I-26 forms the west side of the Columbia beltway between St. Andrews and I-77 at Dixiana. Photo taken by Chris Patriarca (06/08/03). Drivers remaining on Interstate 126 & U.S. 76 west beyond the flyover for I-26 east split with the bypass ramp for I-20 (Exit 107). The ramp circumvents the impending merge of Interstates 126 and 26 west. 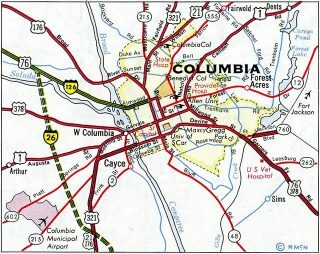 I-20 represents the northern third of the Columbia beltway system as it travels east from St. Andrews to northern reaches of Columbia and I-77 by Windsor Lake. Photo taken by Chris Patriarca (07/06/03). The Carolina Crossroads project will address the weaving traffic pattern along Interstate 26 between I-126 and the full cloverleaf interchange (Exit 107) with Interstate 20. The current traffic pattern sees I-26 expand to ten overall lanes between Bush River Road (Exit 108A) and “Malfunction Junction”. Photo taken by Chris Patriarca (07/06/03). “Malfunction Junction” is the local name given to exchange of Interstates 26 and 20. Closely spaced interchanges on both freeways, coupled with an antiquated cloverleaf interchange design, lead to weaving traffic patterns and regular congestion. Further compounding safety concerns is the adjacent left-hand ramp (Exit 108B) for Interstate 126 east to Downtown Columbia. Photo taken by Carter Buchanan (04/10/16). Sandwiched between “Malfunction Junction” and the Interstates 26 and 126 split is the busy parclo A2 interchange (Exit 108) with Bush River Road. The east-west arterial serves an array of retail across south St. Andrews. Photo taken by Carter Buchanan (04/10/16). The short distance separating the on-ramps from Interstate 20 with the departure of Exit 108B resulted in confusion among drivers differentiating I-126 from I-26. Signs were changed in 1994 to display the Columbia freeway spur in text to better communicate the mainline movement of Interstate 26 east.1 Photo taken by Carter Buchanan (04/10/16). Interstate 26 veers sharply to the southwest ahead of the Saluda River into West Columbia while the freeway mainline defaults onto Interstate 126 & U.S. 76 to Riverbanks Zoo and Downtown Columbia. Photo taken by Carter Buchanan (04/10/16). Interstate 26 turns northeast from the SPUI with U.S. 378 in West Columbia to the two-wye interchange (Exit 108) with I-126 & U.S. 76 east and Bush River Road. Photo taken by Chris Patriarca (06/08/03). Advancing north, Interstate 26 lowers over 100 feet in elevation toward Senn Branch before rising again ahead of the Saluda River and distributor roadway (Exits 108B/A) for I-126 and Bush River Road. Photo taken 07/28/13. 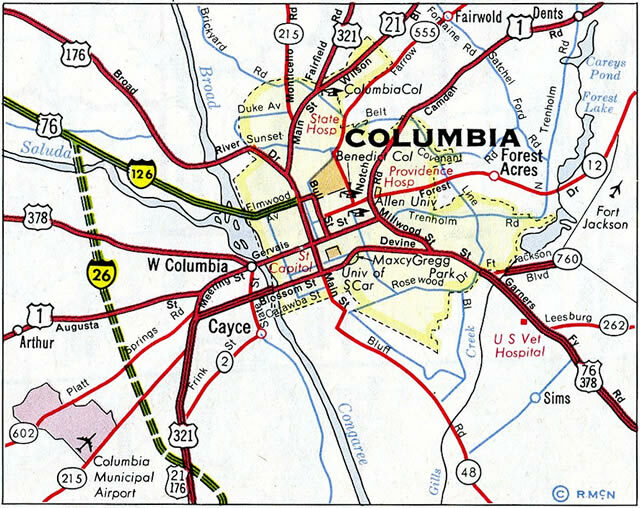 Interstate 26 turns northwest from I-126 & U.S. 76 to join Columbia with Spartanburg, 86 miles to the north. I-126 parallels the Saluda River southeast to the commercial corridor of Greystone Boulevard and Riverbanks Zoo. Photo taken 07/28/13. Two lanes separate for both Interstate 26 & U.S. 76 west and I-126 & U.S. 76 east. A flyover carries drivers from I-126 west to I-26 east in the background. Photo taken 07/28/13. Crossing into Richland County, the Exit 108 c/d roadway splits for Bush River Road and I-126 & U.S. 76 (Lester Bates Freeway) east. Bush River Road arcs west from U.S. 176 (Broad River Road) at Dutch Square Mall to St. Andrews. Photo taken by Chris Patriarca (06/08/03). Interstate 26 makes a sharp curve to the northwest, merging with the west end of I-126 from the right-hand side. There is no access to Bush River Road from Interstate 126. Photo taken 07/28/13. “A Failure to Communicate? – Travelers Follow the Signs to Crossroads of Confusion.” The State (Columbia, SC), May 26, 1994.